Since the holidays are coming up, I thought I would reboot a favorite (and EASY!) 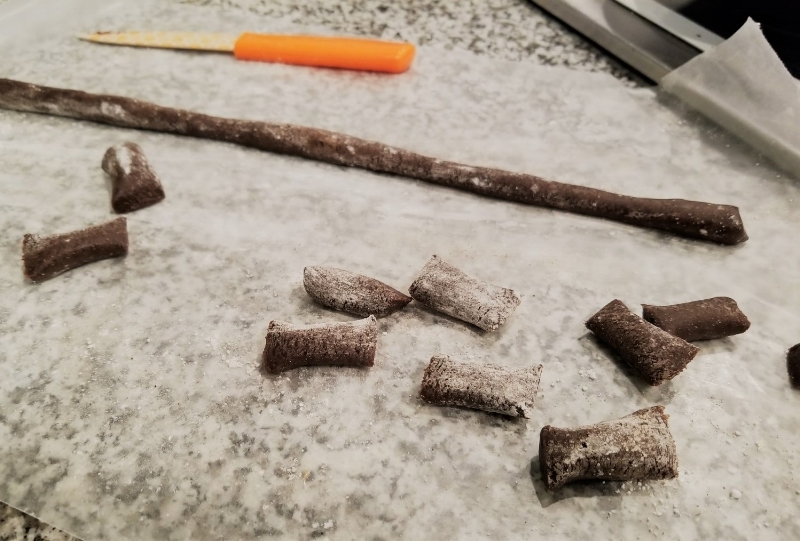 recipe of mine -- tootsie rolls! Fork and Beans first featured them and I adapted them to my needs. My Stout Infused Tootsie Rolls are quite yummy. But so are these holiday ones! Listen -- I come from a long line of tea drinkers. Don't get me wrong, I love the smell of coffee and it does come in handy while baking...but the taste is not for me. My mom pretty much always has a mug of hot tea in her hand (even in July when it's 80 degrees outside) and my dad is a faithful iced tea drinker. I often think that when I get older, I'd love to travel to England and go to tea school to learn about brewing and such things, like a sommelier for tea! Life goals. When Adagio Teas reached out to me, it was a no-brainer. In Pittsburgh, I would get my loose tea wholesale from Prestogeorge in the Strip District, but down here, in the south, I haven't found a good place to buy gourmet loose tea. I must say that my experience with Adagio has been great. Their website is easy to navigate and they let you buy small sample sizes that make about 10 cups of tea each! With that option, I was able to sample many teas -- and I can honestly say that there wasn't one I did not like. I like to do black tea in the morning and herbal teas at night, because I already have trouble winding down at night. One of my favorite teas was their Earl Grey Lavender tea. Now Earl Grey is not my go-to tea because it's too strong for me most of the time -- and lavender can be too strong too. I was intrigued and pleasantly surprised that the bergamot and lavender balance each other out in their blend (at 12 cents per cup!). I also loved their herbal Roobios Vanilla Chai -- what a wonderful way to wind down after a long day. A note for vegan readers: when I asked a representative from Adagio about vegan options, she said that all of their non-flavored teas are vegan and so are their herbal teas, which are mainly dried fruits and herbs. Most of their flavored teas are as well, but they cannot guarantee as some of them have natural flavors which may include honey. For more specific information, please contact Adagio directly. For this recipe, use a strong, black tea for maximum flavor. This could not be easier! In a heat-safe container, pour boiling water over the dates and tea diffuser. Allow the dates to steep for about 10 minutes. While you are waiting, combine the dusting ingredients in a bowl. Set aside -- don't put the dusting ingredients in with the main batter! Discard the tea/water; place the dates in a food processor along with the other ingredients. Process them all until smooth and it looks like what you would imagine tootsie roll batter to look like.